In an industry built on high-energy, explosive, loud, and point-assessing experiences, a number of developers over the last several years have begun searching for slower ideas to dream up video games around. And whether by design or by accident, this has led to audiences or developers themselves classifying games or aspects of them as something seemingly antithetical to the idea of video games: meditative. I spoke with three such developers: Snowman founder and creative director Ryan Cash, who created Alto's Adventure and Alto's Odyssey; Giant Squid co-founder and creative director Matt Nava, who created ABZÛ, and Stu Maxwell, lead developer of Shape of the World and (by day) lead VFX artist at The Coalition. The former two both lead the creation of games with specifically "meditation" or "zen" modes, while Maxwell made a game that he describes as like a "bike ride through the woods while really high." So, meditative, of sorts. Another commonality is that all three of these games were inspired by real life experiences doing intense physical sporting activities. Cash told me that Alto's Adventure was born from a mix of inspirations: it took the immersive feeling Cash felt when playing Tiny Wings combined with the gameplay of another mobile title, Ski Safari. He then added his personal experiences snowboarding and skateboarding growing up to create the final vision alongside lead artist and developer Harry Nesbitt. "There are a lot of games that might look like they'd be relaxing and have a nice soft art style or a nice song, but sometimes it doesn't come across"
Maxwell's experience biking through the woods of Vancouver didn't involve any actual drugs, but definitely was a kind of zen experience. "When I was starting to make this game, my career was under control, I had no kids, and I was doing a lot of biking through Stanley Park which is Vancouver's big, old growth forest right next to downtown," he said. "It's gorgeous. There are a ton of paths to get lost in, go biking, and I'd go down there maybe a couple times a week and keep choosing new paths. You get lost a little bit, but it was that awesome type of getting lost where you're not in danger. You're just temporarily, blissfully unaware of a goal. I wanted to capture that spirit in an exploration game. "So [in Shape of the World] there are these open areas, but they have boundaries. It's a safe freedom. You can just go any direction you want and you know at any moment you'll get back on track. There are lots of secret... not paths exactly, but areas you'll get funneled down and eventually you'll loop back to where you're going. The whole time there are these triangles in the world that are guidance landmarks if you ever feel like getting back on track. You feel comfortable to just get lost." And Nava was inspired by, you guessed it, scuba diving. "Ask any diver and they will tell you that scuba is very meditative," Nava said. "When you dive, you leave your normal life behind. You don't have to worry about running out of air because you always take far more than you need, and you become weightless. You float perfectly and calmly, surrounded by beauty. You focus on your breath, and the majesty of the ocean floods over you. We wanted ABZÛ to reflect this experience of diving rather than simulating the technicalities of scuba, and meditation mode was one way to give players a sense of it." Though all three development stories share that interesting sporting commonality, the actual development of a meditative aspect came at different points for each. 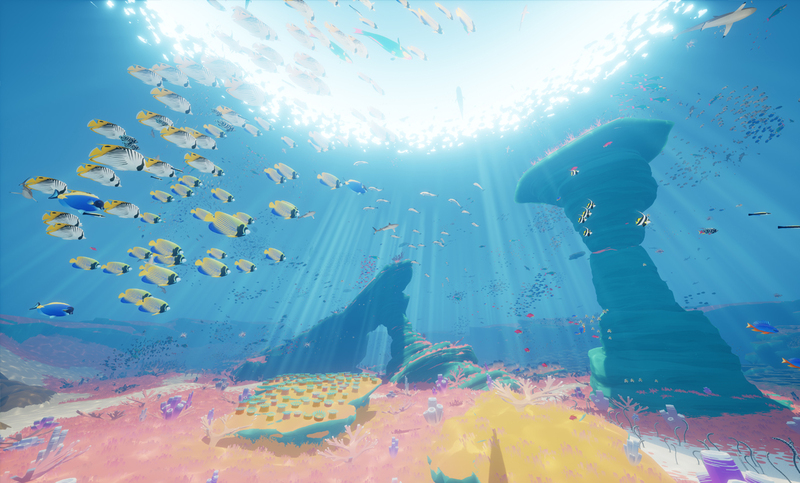 For ABZÛ, the game's meditation mode was planned from the beginning and intended as an integral part of the gameplay experience. As players explore, they can take a moment to sit and meditate on certain statues on the ocean floor. The player's view will then switch to that of one of the many sea creatures in the area, offering the creature's name and perspective on-screen until the player decides to end the meditation, or view a different creature. "Meditation in ABZÛ was an idea that came out of early brainstorms by the team when thinking about one of our main goals with the game, which was to create a sense of connection with the sea life," said Nava. "Many of the features of the game were designed with this purpose, such as the abilities to attract schools of fish with chirps and to ride larger creatures. Riding fish was a great way to create a connection, but it didn't work for small fish. We wanted to create a way for the player to connect with all the creatures in the game, even tiny ones that you might not even notice playing normally." 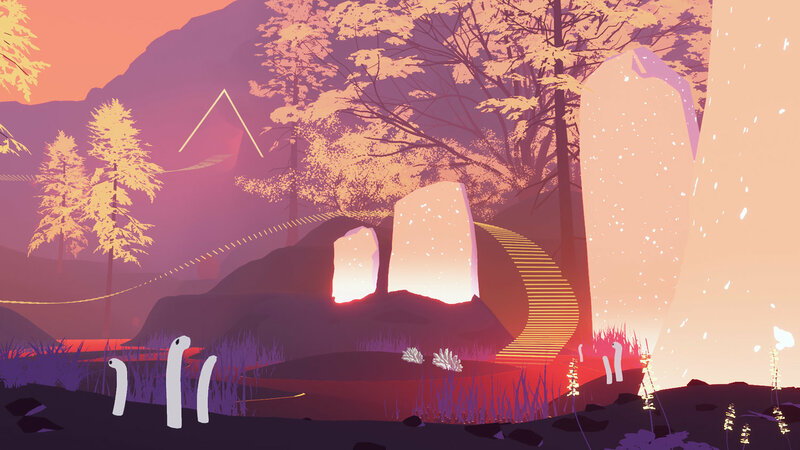 The meditative aspects of Shape of the World, a walking exploration game where the player traverses several brightly-colored natural biomes, also developed alongside the game's development, if perhaps a bit less deliberately. "In the early years of developing this game, I was doing yoga," Maxwell said. "And I was going to this yin yoga class which is basically quiet, slow stretching in the dark. You just stretch, listen to pleasant music, and they tell you, 'Don't think about anything.' You're there to just focus on your breathing and the feelings in your body and let go of your thoughts. But then I'd be like, 'Heheheh, I'm going to think about my game.'" "They tell you, 'Don't think about anything. '...But then I'd be like, 'Heheheh, I'm going to think about my game.'" 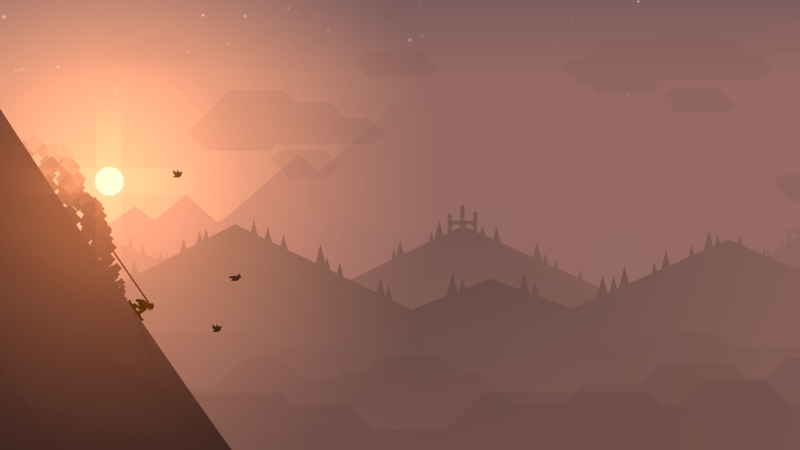 Unlike the other two, Cash said that the Zen Mode added to endless snowboarder Alto's Adventure after its release (and available at launch in its sequel, Alto's Odyssey) was the direct result of player feedback for a game that was already relaxing to begin with. "Once the game came out we heard from a ton of people," Cash said. "People would email us privately or write about it in various reviews, and we had a lot of people reach out to us saying things like they have severe anxiety or depression and the game helps them cope with it, or if they're having an anxiety attack it's been the only thing that's been able to help pull them away from it and calm them down. There was a guy who broke his back and was in the hospital for a week and said the game was the only thing that helped him kill the time. "Touching, heartwarming stories were sent in to us shortly after launch. Not a whole ton of them, but every once in awhile I'd have an email in my inbox from someone thanking us for helping them cope with something. Whether it was the loss of a loved one or their own anxiety or depression or an illness or injury, it just seemed to be really special to people. "So we started talking internally and said, 'Okay, people are enjoying this game, but it's still a game. You can still crash, and you can still die. What if we took this a step further?' People were using the word 'zen' when they would describe the game to us originally. So we started talking about the idea of making a 'Zen Mode' that stripped away everything that was unnecessary to that feeling." Regardless of how the modes and meditative vibes ended up in the game, all three developers agree on their importance, both for the player and for themselves as developers. Maxwell in particular saw working on Shape of the World as beneficial to himself as a developer working on other, very different titles. "I work on Gears of War," Maxwell said. "And I love Gears of War. But it's just so much more demanding. It's a complete mental takeover. You're worrying about strategy, what your hands are doing, it's such a brain takeover. But this game, you can just turn it off. Sometimes I watch streamers who are very good at commentating, who can walk through a game and talk about stuff, but they'll play my game and just run out of things to say. You can see them zoning out; it's not very entertaining to watch. But it is sort of hijacking their analytical side." Developing for relaxation, meditativeness, or zen feelings also imparted a particular responsibility to these teams. The idea of meditative games is a relatively new one, uncommon in an industry popularized by games full of combat, explosions, and relentless action. The tendency, these developers told me, is to err toward more "gamey" activities when developing anything: timers, reward systems, points, and so forth. But often, these elements can break the sense of flow they want their players to feel. "Sometimes I watch streamers...play my game and just run out of things to say"
For Cash, excising these elements was a practical decision that manifested as he developed the Zen Mode that was added to Alto's Adventure. The main mode of the game includes collectible coins, points, achievements, and restarts you if you make a mistake and fall. In Zen Mode, all of those elements are gone. You simply snowboard until you don't want to snowboard anymore. Nava and Maxwell both had to consider immersion breaking in the initial development of their games, and ran into different problems with their initial ideas for meditative experiences failing in the hands of playtesters. For Nava, those problems were directly tied to players' existing expectations of what a video game should be. "Early versions of ABZÛ gave the player the ability to enter mediation anywhere, mid-water," Nava said. "We found that when players had the ability to meditate anywhere, they didn't understand what it was for. We also had early versions where players thought that meditation was part of a puzzle, and they felt anxious as they couldn't figure out what they were supposed to do. It was important to label the experience clearly as meditation and to make a clear transition in and out the mode to separate it from regular gameplay. After those changes, players entered the experience with the correct expectations, and were able to enjoy it." Maxwell's challenges stemmed from a similar idea of player expectations for what to do in a video game, but had effects beyond a single game feature. Rather, his entire game was potentially inaccessible to players if he didn't communicate objectives clearly in the first few moments. "The other challenge that I had to learn slowly over time by playing it in different venues is that people are different. Not everyone treats your game the same way; they have different reference points. Some people are very objective-driven and their satisfaction comes from being optimal in their progression through the game. On the other side, there are people who just want to faff around. There's a big open area, they can throw seeds, go swimming, the joy and the uniqueness of the product isn't in its ability to deliver objectives so much as it gives freedom. I wanted to include both ends of the spectrum and everything in between, so I had to come up with a game design that lets you bring in both of those people." "My recommendation for designers trying to create a meditative experience in a game would be to go out and have one first"
Maxwell's advice for developers who want to make their own games with meditative or zen elements is the same as the advice he gives for any other genre. "Focus on the experience," he said, "and kill everything that detracts from that experience." Nava's view hearkens back to ABZÛ's origins: "My recommendation for designers trying to create a meditative experience in a game would be to go out and have one first. It could be anything; for me it was scuba. Then, let the mechanics of the game be responses to the question of how to deliver the core of your own experience to the player in a clear and meaningful way." As for Cash, he recommends developers take a step back and examine their relationships to the games they are making. "While you're making a zen mode or game, you should never be able to get sick of your own game," Cash said. "I played Alto for three years straight, and it never gave me that feeling you get when a song is stuck in your head and is frustrating you. I'll be driving and whistling the music or singing it in my head, and even seeing the game itself I always felt relaxed even though it was my work. "There is certainly a stage of game development where that's not the case because you don't have any of the music in or the art is far from final, but that's still a good indication. Does it make you, the creator, feel a sense of relaxation and calmness? There are a lot of games that might look like they'd be relaxing and have a nice soft art style or a nice song, but sometimes it doesn't come across. If you're making a game yourself and you're not finding it's hitting the mark, you have to ask yourself if anyone else will." You have forgotten Proteus by Ed Key, a pioneer in the meditative genre. A true masterpiece that prefigures great games like Shape of the world.